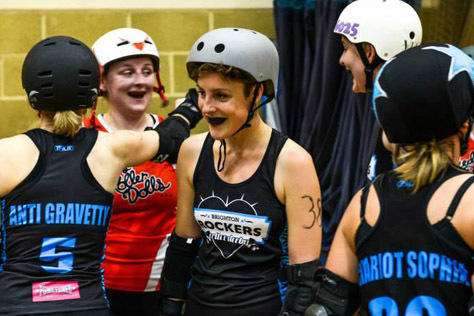 This weekend sees the mighty Rockers back on home turf for the first time in more than six months. 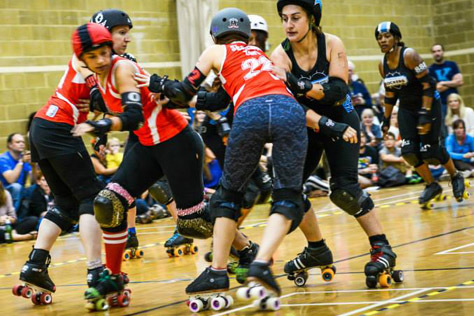 They take on Leeds Roller Dolls’ A-team Rebel Roses on Saturday (21st September) at the Dolphin Leisure Centre, a few minutes walk from Haywards Heath station. Doors are at 2.30pm with first whistle at 3pm, and you’ll find links to the FB event and tickets page at the end of this preview – online tickets are just £10 (free to under 12s) and will likely be taken off sale at some point on Friday, so get in there quick if you haven’t already. We’ve been looking forward to this bout since it first popped up on LRD’s website calendar a few months ago, as we’re expecting it to be a bit EPIC. 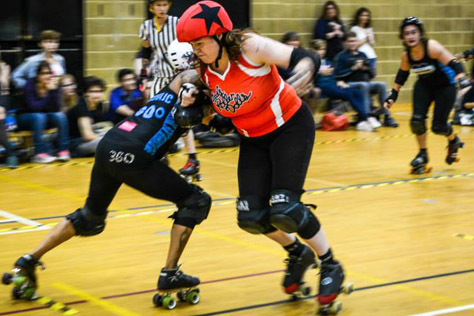 There are various ranking sites that rate different derby leagues based on complicated algorithms, but the one we’ve always found the most reliable (and the one the UK Roller Derby Association itself is involved with) is that at flattrackstats.com. They currently rank Leeds as the 7th best league in the UK and Brighton 10th. Given Brighton’s home advantage, that suggests this should be a close one. For those yet to experience the delights of the Dolphin Haywards Heath, first be careful which map you use to find the place. A medical centre and pub (whose name has now changed) also appear as The Dolphin on many online maps. The leisure centre is located on Pasture Hill Road, roughly five minutes walk from the train station (10-20 mins journey time from Brighton, 40-50 mins from Central London). 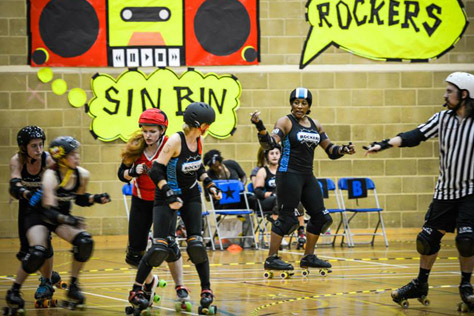 Turn left and follow the roller derby arrows stuck to lampposts. The pub opposite the station (the Burrell Arms) isn’t too bad for a station sports pub if you have time to kill. 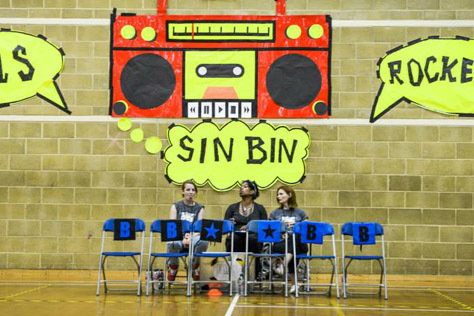 The leisure centre itself is blessed with two bars; a cafe style place also doing bites to eat in the main foyer (with limited outdoor seating for cigarette types) and a small bottle and can bar a few corridor turns past the sports hall. 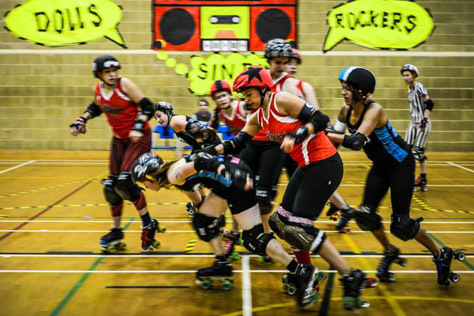 There will be the usual selection of derby delights in the hall, and the designated charity for the bout is Tree of Hope. The event’s name PUMP UP THE JAM gives away the theme, so wear your finest 80s/90s style hip hop gear if you’re into dressing up and that. 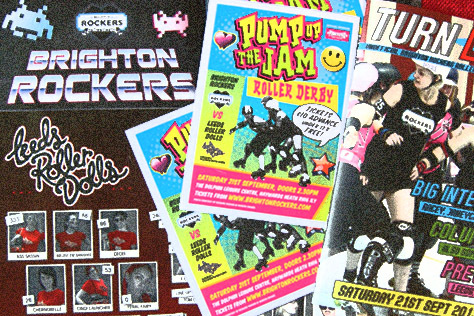 As well as the official bout programme, issue two of our unofficial fan magazine will be available to pick up on the day. The after party is back in central Brighton in the legendary Rockers-favoured Marwood coffee shop. Coffee shop? Don’t panic – it has an alcohol licence, as well as a gnarly ‘secret garden’.